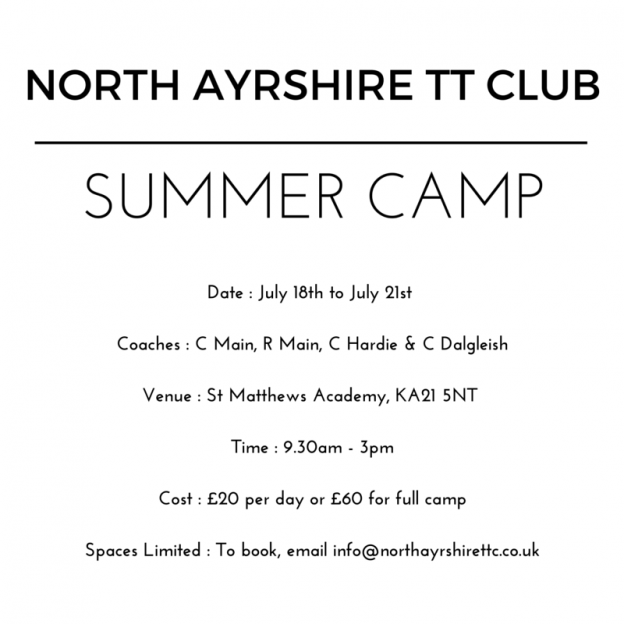 North Ayrshire TTC are running their Summer Camp on 18th – 21st July at St Matthews Academy. There will be 4 full days of table tennis on offer, with each day running from 9.30am – 3pm. Coaches Chris Main, Richard Main, Craig Hardie & Colin Dalgleish will be delivering the sessions which will include a variety of training methods based around improving the quality of each players first 3 shots. Cost is £20 per day or £60 for the full 4 days. Each day will be limited to 18 players, so players are advised to book early to avoid disappointment. For more information and to book please email info@northayrshirettc.co.uk or contact one of our coaches. This entry was posted in Latest News on 24th June 2016 by Chris Main.